A man who shouted vile abuse at police was later found with drugs. Richard Johnson, 35, had disturbed neighbours and as police went to arrest him, a lump of cannabis fell to the floor. Johnson, of Whittaker Avenue, Layton, admitted behaving in a threatening manner and possession of cannabis. Pam Smith, prosecuting, said after shutting a door on an officer on August 5, Johnson swore and shouted out of a window. Residents from three addresses complained. Allan Cobain, defending, said Johnson had combined alcohol with cannabis and was irate because he had argued with a friend. 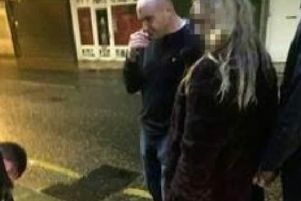 He was fined £150 with £85 costs and ordered to pay a £180 court charge with £20 victims’ surcharge by District Judge Margaret McCormack at Blackpool Magistrates.